AUTHORS: Kyle Higgins, Steve Orlando. Mighty Morphin Power Rangers is more than just a nostalgia trip, folks. Kyle Higgins, Hendry Prasetya, and the team are showing us things we could never have seen on the show. For this reason among others, I’ve got high hopes that this series will compliment Power Rangers in the same way IDW’s Ghostbusters compliments that franchise. They’re entirely different books. But like Ghostbusters, MMPR benefits greatly from the lack of television limitations. Tommy, the Green Ranger, is getting used to life as a Power Ranger. But the Rangers are getting used to life with Tommy as well. This new teammate changes their dynamic, leaving at least one Ranger wondering if the addition of Tommy is a good thing. Meanwhile, as if Rita Repulsa continuing to plot against the Green Ranger wasn’t enough, Tommy continues to see visions of her in his head. Higgins and Prasetya have a pretty straight take on the Power Rangers universe, which is a surprise considering how goofy the show could be. MMPR was a strange beast. It could be very dramatic in certain episodes, but focus more on comedy in others. Higgins’ dramatic scripts, ripe with teen angst, are refreshing. To my knowledge, we’ve never seen PR comics done this way. As someone who grew up with the show, it’s nice to see a universe I love so much treated with this kind of respect. In this issue we see the Power Rangers have an equivalent to the X-Men’s Danger Room. The “pocket dimension” allows Zordon and Alpha 5 to manipulate and create artificial crises for the Rangers to practice responding to. 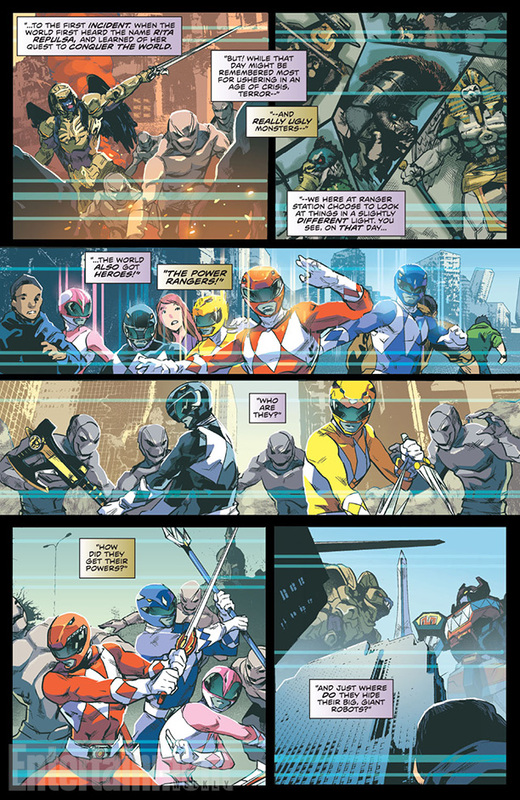 In this case, Tommy and Kimberly are responding to a monster attack, and the Green Ranger practices guiding civilians to safety. It’s the kind of thing you’d expect an inter-dimensional wizard like Zordon to have, and it’s an interesting tool for plot and character development. Zack seems to be implying that it was Zordon’s decision to put Tommy on the team. Ultimately, I suppose it was. But in Green With Evil, Part 5, it’s Jason who extends his hand and asks Tommy to join them. None of the others seems to object to it. Granted, I’m reading heavily into something that probably wasn’t thought out so extensively. But it is the source material. On the other hand, Zack might be wondering about Zordon simply having a talk with the five Rangers about their new teammate. Either way, it’s confusing. This is what happens when you adapt something as beloved as Power Rangers. Geeks who grew up on it (i.e. me) start to nitpick at little things. Hendry Prasetya is stronger at action than he is at the scenes with the teenagers. This issue is heavier on the latter, so I wouldn’t say he’s in his best element here. But I buy his renderings of the characters from the show, so I can’t bring myself to sling much mud at them. On the subject of art, looking at the variant covers for this issue, you see names like Dustin Nguyen, Philip Tan, and Paul Pope. Again, as a life-long Power Rangers fan, it’s really cool to see big name like that associated with this book. Also among the variants is piece by Goni Montes, who as far as I’m concerned can keep drawing Power Rangers stuff as long as he wants. It’s tough to get tired of looking at his work. 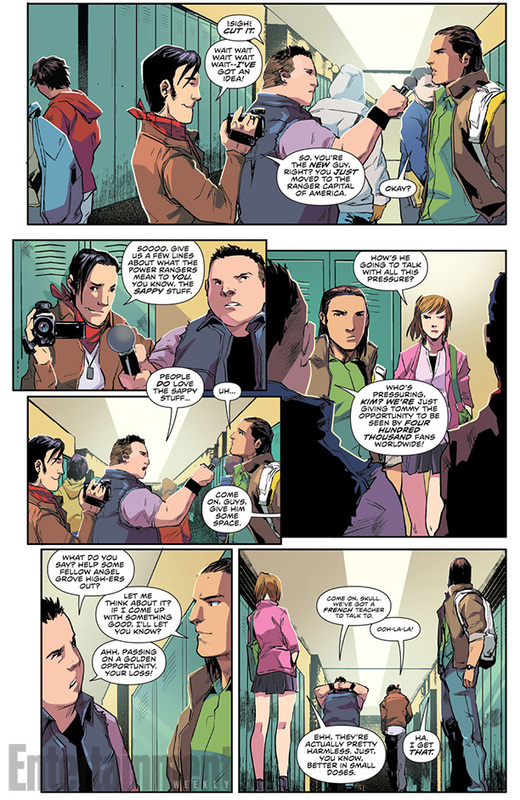 Higgins, Prayseta, and everybody on Mighty Morphin Power Rangers have kept some tremendous momentum going from last issue. As a ’90s kid, that’s really exciting. Just as the TV show has a special place in our hearts, I imagine in time this series will too. This entry was posted in Comic Books/Graphic Novels and tagged BOOM! 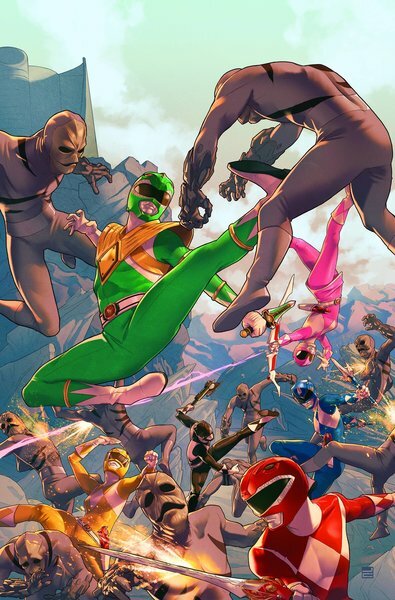 Studios, Bulk & Skull, Corin Howell, Goni Montes, Goni Montes Power Rangers, Green Ranger, Green With Evil, Hendry Prasetya, Jamal Campbell, Mighty Morphin Power Rangers, Mighty Morphin Power Rangers #0, Mighty Morphin Power Rangers #1 (2016), Mighty Morphin Power Rangers (BOOM! Studios), Power Rangers, Rita Repulsa, Steve Orlando on 03/06/2016 by primaryignition.